This is what the captain fireman told Montag in Fahrenheit 451. When Ray Bradbury wrote these lines with a public typewriter in the UCLA library in 1951 television was relatively a new phenomenon in the United States and was unknown in most parts of the world. Nevertheless, in his book, Fahrenheit 451, Bradbury had some pretty decent predictions as to how media and technology would shape our daily experience. In his vision the walls became TV screens. TV programs did not have a story or narrative but just a continuous flow of people speaking without any content, and colorful, interesting views and sounds. And the most you get from TV was chunks of factual information without context and perspective. Bradbury’s book is often compared to George Orwell’s 1984. In a sense, 1984 is a criticism of communism and Fahrenheit 451 is a criticism of the capitalist society of future. I think Bradbury’s vision turned out to be more realistic than Orwell’s. I find a movie, from an entirely different genre, to be very close to Fahrenheit 451 in the way it portrays our future. 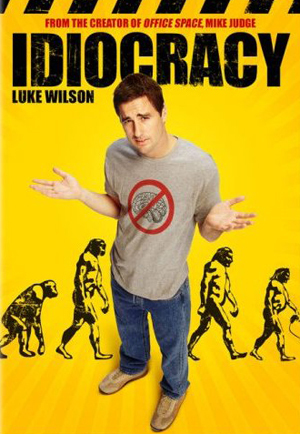 Idiocracy (2006), directed by Mike Judge (remember him from Office Space? ), is the story of a guy who wakes up 500 years from now, after a failed army experiment, and finds a society which is so dumb that he becomes the smartest person in the world. In this comical world English is reduced into a couple of hundred words, people irrigate crops with an energy drink, and TV programs are nothing but a collection of nonsense clips without a narrative or focus topic. Although Idiocracy is comical and Fahrenheit 451 is dramatic, they both portray a future in which humans used scientific advance and technology for instant gratification and making life more convenient without caring too much about broader issues. I find myself thinking about both works of fiction while I try to understand where the day by day changes in how we use media and technology will lead us to. Fahrenheit 451 is full of good predictions about the future. For example, the idea of wall TVs was similarly echoed when Bill Gates proposed that all surfaces in our homes and offices will be computers in the near future. Nevertheless, Bradbury missed the target with one important issue, books. Unlike what was predicted in his book, we never needed to burn books. Instead, we digitized them! I personally have never met anyone who read an entire book from a computer. I do not deny the practicality of a digital book. I have often used Google books to find quotations that I did not take note of when I read a book. However, it would practically be torturous to read a 300 page book from a computer. For that reason they made the e-book readers like Kindle and Nook. I really don’t think that any digital device can replace the through enjoyment of reading a printed book. Why is it so difficult to read a book from the computer or an e-book reader? One factor is habits. Most of us are simply not used to reading books from a screen and habits are difficult to change. The second reason is the resolution of the screen. No screen can get close to the quality and resolution of a printed page. A third reason is that a book is not a book when it is digital. When it comes to books I believe that the medium part of the message. When you digitize the book, what the book is about changes too. A book is not a long string of words that can be presented in any medium. A book is a book when it is on paper and bound. Even the etymology of the word book reflects this. When it is digitized, for me, it is just an advanced index, helping me to find a phrase that I can’t clearly remember. So, why do people want to use e-book readers? I think one motivation is the idea of having hundreds of books in your posession. Although you will probably never read most of them (if any) it is a form of empowerment to compress all these big books into a little device, under your hand. In this sense, it might be a power issue. I will even go further to claim that this may be a form of anti-intellectualism. You beat the Book by putting it in your hand-held prison, the e-book reader. E-book readers also fit to the general trend of making it convenient to reach information. According to this trend all human knowledge should be projected on a two dimensional digital space, where it is stripped of its history, original medium as well as its limitations, to become part of the big digital space of information. In this new model there is not substance to the medium. What we call knowledge is a collection of bits, no matter if it is a book or a painting. A pdf copy of a book will never have a unique history. It won’t be registered to a library, it won’t be given as a gift, and it won’t take place on a shelf. It will just be an idea that becomes temporarily real when you open it on your e-reader, and then it will disappear. In this sense, it won’t be a commitment to buy a book, or borrow it from the library. Since it won’t take place in your living space the book will never be there. But it will always be there because you can hypothetically reach to it anytime you want. In this sense, all books and all the information in the world will always be there since it is always accessible. Nevertheless, you will never have a personal library, a physical space that you can go back to and visit your previous readings by touching on books and going over your notes. I believe that innovations on how we reach and use information are underlined by our assumptions about human cognition. We still dominantly believe in the cognitivist notion of mind and body separation. Since the mind is assumed to be independent of bodily processes and physicality it does not matter how we feed it with information. In this sense the medium of information is not of importance. Reading a book from an e-book version or in printed form should make of no difference. But it does. The human mind is embodied. The physicality of the book compared to the e-book reader changes the way we interact with it. The book provides a physical reference to our interactions with it, what we learn from it and how it changes us. We do not have that type of physical reference, an anchor, with digital information. The e-reader or the computer is a gateway to the ocean of free-floating signifiers. There is no anchor and no physical reference.